Landscape rocks add natural beauty and depth to a yard. Whether used as a focal point in a rock garden or around the foot of a slope, setting rocks and boulders in the right spot brings balance and anchors a feature. Moving landscape rocks is a challenge due to their size, weight and irregular shapes. 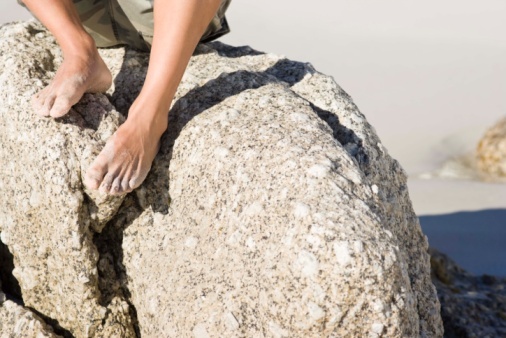 If you're moving rocks yourself, the right tools and technique will prevent injury and enable you to set each rock precisely where you want it to go. Large boulders establish a rock garden as a focal point. Landscape rocks come in a wide range of sizes. Small rocks can serve as inorganic mulch or as casual pathways when spread directly over dirt. While small rocks are lightweight, typical projects require a large volume. Use your hands to transport them in small batches or fill a bucket half-way and transfer the rocks with several trips. For large amounts, use a wheeled trashcan. Always lift with your legs and bend at the knees to guard your back from injury. Medium-sized rocks like fieldstone are often used for garden and driveway borders, while flat rocks are used to build dry-stacked partial walls. Transferring medium rocks by hand is possible, but it's a slow, laborious process that will tire you out before you even begin building. Rock sleds and wheelbarrows offer an efficient way to move medium-size rocks without damaging yourself or the lawn. The one wheel of wheelbarrows makes them easy to maneuver through tight spaces without causing damage to surrounding areas. Only transfer a few rocks at a time until you feel comfortable with additional weight. Balance the rocks in the wheelbarrow to distribute weight evenly. 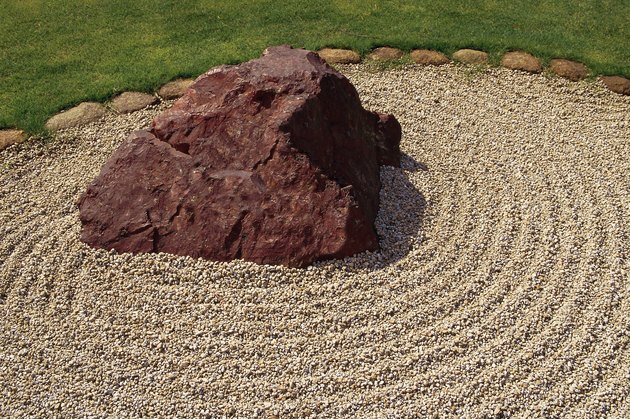 Larger rocks provide a calming place to sit or an eye-catching addition to a large garden but they are often too heavy to move with a wheelbarrow. Depending on the size, a few tools to consider renting include a skid-steer loader or a hand truck, or you can pull the rock over landscaping polls using rope or a chain. While a skid-steer loader is the most efficient option, it entails driving the small vehicle over your lawn, possibly damaging plants and grass. Use rope to secure a rock to a hand truck. Note that pushing large rocks with a hand truck is simpler and less dangerous than pulling them with rope or chain. Moving large rocks is not a task to rush. Take the time beforehand to carefully plan out exactly where you want the rocks so you only need to move each rock once. Work in teams of at least two at a time and take frequent breaks. If you're transferring a large number of boulders, consider the amount of time and physical effort you can save by using a machine to do all or most of the labor. Aurora LaJambre is a writer and editor living in Brooklyn, N.Y. For over five years she's covered topics in culture, lifestyle, travel, DIY design and green living for print and online media. Her publication credits include "WOW Women on Writing," "Six States" and Catalogs.com. She graduated from New York University in 2003 with a Bachelor of Fine Arts in creative writing. What Is the Difference Between a Skid Steer & a Bobcat?